Shiva hours: from 2:00 to 4:00 and 7:00 to 9:00 p.m. daily through Thursday evening. Evening services at 7:30 p.m.
Jewish Community Foundation, (514) 345-6414, or to AMI-Québec, (514) 486-1448. Dear Jackie and family, My sincere sympathies on the loss of your father. May your many wonderful memories bring you comfort at this difficult time. Thinking of you. Dear Sandra, My heartfelt sympathy to you and your family on the loss of your dear husband. Madeleine. We were neighbours for many years, and we always found Barry Clamen to be a true gentleman, with a level of sophistication that impressed us. Our condolences to the entire family. Dear Sandra, Lois and I were very sorry to hear of Barry's death. We wantto express our sympathies, and we hope thatyu can exxtend them to allof your family members. WE are only just back from California, but we hope that we will see you soon at Westmount Square. Dearest Jackie & Family, My deepest sympathy on the loss of your father. My thoughts are with you at this most difficult time. May all your wonderful memories be a comfort to you and your family. Dear Jackie and Family, Sorry to hear of the passing of your father. My deepest condolences to you and your family. Dear Clamen Family, I would be remiss if I didn't add my condolences and memories of Barry to the many I am certain you have received. His caring, social concern, and true professionalism were apparent when, early in our respective careers, he called to express concern over a tax ruling that negatively affected many of us, as young professionals. He voluntarily organized a group of professional firms to contest (and eventually win) the case using my issues as the test. This exemplifiied the qualities we all came to admire and respect. May your memories of this special man serve to ease the pain of your loss. Dear Jackie and family, I'm so sorry to read of your loss. Wishing you comfort and strength from the love and support of family and friends. Our community has been diminished by the passing of this fine gentleman. On most occasions when visiting Montreal I would make it my business to have lunch at Le Mas and sit at "The Chairman's" table. My condolences to the Clamen family. Barry will be missed. Dear Jackie, I am so sorry for your loss. I want to extend my deepest condolences to you and your family on the loss of your father. Dear Sandra,Jackie,Warren and family, We were so sorry to learn of Barry's passing. Since we are in Florida we could not attend the funeral or shiva. I only got to know Barry during my practice as a lawyer. I developed a friendship that I cherish. He was a great individual and wonderful professional. We will all miss him. Elaine and I express our deepest sympathies on your loss. Dear Jackie, Warren, Brian, Jenny, and family. I was terribly saddened to learn of Barry’s passing. Over the years I will always remember our encounter’s and wonderful conversations at the Square. He will be missed. Please accept my heartfelt condolences at this very difficult and sad time. much luv. Dear Jackie, Our deepest condolences on the loss of your beloved father. Our thoughts are with you and your family. Dear Jackie, Jenny and family. We were sorry to hear of the passing of your father and grandfather. We hope that your great memories will help you through this difficult time. Dear Clamen Family. Please accept my deepest sympathies on the passing of Mr Clamen. I worked with Mr Clamen over many years while I was at Richter. He was always the ultimate professional. I hope your memories help through this difficult time. Dear Jackie & Family, Our sincere sympathies on the loss your beloved father. We hope all your wonderful memories help to brighten the days ahead. Dear Jackie and Family, We are truly sorry to hear of the loss of your father. Our heartfelt condolences go out to you and your family. Dear Jackie, My heartfelt sympathies to you and your entire family. Dear Jackie, Brian, Jennie & family, So sorry for your loss. Thinking of you at this sad time. Dear Sandra and Clamen family. Sincere condition the loss of your beloved Barry. Dear Sandra, Jackie and family. Our deepest condolences on your beloved loss. May all your happy memories help you through this difficult time. Philip & Lotte Manel wish you are most sincere condolences. Barry was a great guy. Dear Jackie my deepest sympathy to you and your family. Dear Jackie, So sorry to read about your Dad's passing. My heartfelt thoughts are with you at this difficult time. With deepest condolences. Dear Warren and Family, I was saddened to learn of Mr. Clamen's passing. I will always remember him as the consummate professional and a true gentleman. May your memories bring you comfort and strength through the difficult days ahead. Dear Family. I have warm and wonderful memories of Barry from RUV. I remember his wonderful smile and warmth. May you take comfort in knowing that he touched so many people. Dear Jackie and family, My deepest condolences, thinking of you at this difficult time. Dear Jackie , my condolences to you and your family at this very sad time . Dear Jackie and family My deepest sympathy to you during this difficult time. May you find strength and comfort in each other . TO SANDRA, WARREN AND JACKIE MY DEEPEST SYMPATHY ON THE LOSS OF BARRY. i HAVE MANY MANY FOND MEMORIES. MY THOUGHTS ARE WITH YOU. Dear Jaquie,Jerry & I send heartfelt condolences to you & your family.So sorry for your loss. Jackie: With deepest sympathies to you and your family and the hope that many fond memories will serve as a small measure of comfort in the days ahead. To jackie and family i am so sirry fot your loss. My thoughts go out to you at this time. Dear Sandra and family, I was so sorry to read of this sad news. Please accept my sincere condolences for the loss of your beloved husband, father and grandfather and may you continue to be a source of comfort to one another at this difficult time. Dear Sandra and family. My thoughts go back to my first impression of Barry as the smartest accountant I've ever met, as well as a true mensch. My sincere condolences. George. Dear Sandra & family. Our condolences to the entire Clamen family. What a great guy. Perri & Bryant. dear Clamen family, my deepest condolences on your loss. Barry was not only a great mentor but a devoted friend in all the years that we worked together. may he now rest in eternal peace. Dear Sandra & Family, Our deepest sympathies to all of you. Our many memories go way back in time to a very happy place. We have shared so much and will never forget. Florence, Jody , Dayna and Erica. Dear Sandra, Bonnie and I extend to you and your family our most heartfelt condolences. Barry was the personification of the expression " a scholar and a gentleman." I never heard anyone say a bad word about him and he was well respected in the tax community. We had great days together at Pinegrove and our annual golf trips after the course closed. I also fondly remember our trips to Europe to attend the annual International Fiscal Association tax conferences. Dear Jackie and Family Please accept my condolences on your tremendous loss of your dear father. Thinking of you at this very side time. Dear Jackie- My sincerest sympathies to you and yours on the passing of your father. Sandra, I am so sorry for your loss. I remember you and Barry from Pinegrove. Seems like a lifetime ago. Dear Warren and Family , My sincere condolences on the loss of your father . It was an honor to work with him. He was a true gentleman. It is a difficult time ( as I know too well ) and I wish you and the family much strength . Our sincere sympathies. We never part with those we love, as they are with us always in heart and spirit. Barry was first class in every way possible. A gentleman. Always with a smile. A leader in his field. Proud to have known him. May the family all find the comfort in those memories that are yours to cherish, strength in the friendships of those who share this loss. Special blessings. Dear Jackie & family, We are sending you our most sincere condolences on the passing of your dad. His memory will live on through all of you forever. Our most sincere condolences. Take joy in each other and in your best memories. Dear Jackie & Family, My sincere condolences to you and your family on the loss of your father. My thoughts are with you during this most difficult time. Dear Jackie, So very sorry to hear of the loss of your dad. Thinking of you and sending hugs along with my deepest sympathy. Nancy. My sympathies to all who knew Barry. His kindness, compassion, sense of humour and gentlemanly spirit will always be remembered. Dear Jackie and family. My sincere condolences and thinking of you at this difficult time. Dear Sandra, Our sincere condolences to you and your family.Barry was a true gentleman and a mensch.Not only do we remember the good times we had with you both at Pinegrove--but also our special Wednesday nights where 6-7 couples partook of friendship, food and drink at different restaurants. Barry--you will be missed. Dear Sandra My deepest sympathy to you and your family on the loss of your dear husband Barry. My thoughts are with you in your time of sorrow. Fondly, Ellie. Dear Sandra, Jackie, Warren and to the entire Clamen family. My deepest condolences on the passing of Barry. I hope that fond memories of him sustain you during this very difficult time. Heartbreaking news ! We have known them for eons--We send you all our sincerest condolences and may his memory forever be a blessing. Dear Jackie, You are in my thoughts at this difficult time. Sending you my deepest condolences. Dear Warren and family, I'm so saddened to hear of your loss. It was a lifetime ago that I spent so much time at your house in Snowdon but I remember with such fondness your dad's amazingly warm smile. There was always so much laughter to be had with your family, and I still cherish the time we had together. I hope you find strength in being together, and may the memories you have of him bring you a sense of peace. Warm hugs to Jackie and Sandra, and know that you are all in my thoughts. Dear Sandra, Jackie, Warren and Family...it is with a heavy heart that we offer you all our sincerest sympathy. We were shocked to hear of Barry’s passing, and wish you all, comfort in your memories and strength to carry you through this most difficult time. Dear Sandra,Jackie &Warren, We are so sorry to hear of Barry's passing.We recall all the good times we shared at Pinegrove.May these wonderful memories sustain you at this difficult time. Dear Sandra,Jackie &family, saddened to hear of the passing of Barry.Cherish the wonderful memories. Our sincerest condolences. We hope that his legacy as an exceptional person will help to ease your grief. Dear Sandra and family my heartfelt condolences . Let the good memories keep you strong. Robert. Dear Sandra, Jackie &Warren. Iam saddened to learn of Barry's passing. I have fond memories of weekends spent together with our families at Bob's Motel in Messina N.Y. I hope that memories & the support from family & friends will help sustain you in the difficult days ahead. Dear Clamen family please accept my condolences, I have some good memories playing golf with Barry at ponegove golf club. Peacefully at home, with his family by his side, on Saturday, April 6, 2019, in his eighty-third year. Beloved husband of Sandra Klein. Loving and devoted father and father-in-law of Jackie Clamen and partner Irwin Bercovitch, Warren Clamen and Guy Saint-Arnaud. Proud Grandpa Barry of Brian and Jenny Singer. Treasured brother and brother-in-law of Allen and Rhoda Clamen, Miriam and the late Marvin Clamen; and brother-in-law of Linda and Allan Steinberg. Barry will be deeply missed and lovingly remembered by his nieces, nephews and family, by his lifelong friends, Howie Gilmour and Marvin Corber, and by his many other dear friends and colleagues. Funeral service from Paperman & Sons, 3888 Jean Talon St. W., on Tuesday, April 9 at 12:00 noon. Burial at Congregation Shaar Hashomayim Cemetery, 1250 ch. de la Forêt. Shiva at his home, 3 Westmount Sq. #1214, from 2:00 to 4:00 and 7:00 to 9:00 p.m. daily through Thursday evening. Evening services at 7:30 p.m. 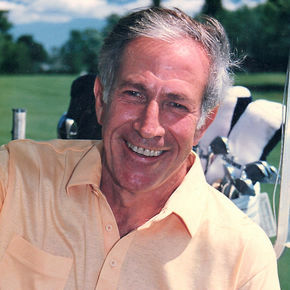 Contributions in Barry’s memory may be made to the Jewish Community Foundation, (514) 345-6414, or to AMI-Québec, (514) 486-1448.